“Country Pub voted Fitz among equals” was a quote from one of the newspapers reporting on Fitzpatrick’s Bar & Restaurant being the first pub in county Louth to win the All Ireland title in the Black & White Whisky Pub of the Year Arward. Owners Danny & Dympna Fitzpatrick were the toast of the town and gave high praise to their staff. Considering the massive competition and the wonderful establishments throughout Ireland, the whole establishment were over the moon at their phenomenal achievement. They are no strangers to success in this particular competition as they won the Louth title in 1996, 1998, 2000, 2001, & 2002, the Leinster title in 2001& 2002 and the All Ireland title in 2001. The award was presented based on Fitzpatrick’s standards of hygiene, staff efficiency and friendliness, inviting appearance and the well-served range of drinks; vital criteria to any award- winning establishment. 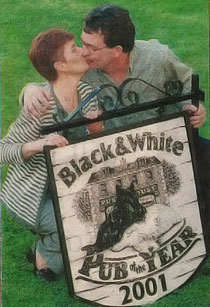 Following the award, celebrations at the pub went on into the early hours as customers thronged the premises to congratulate the award winning couple.